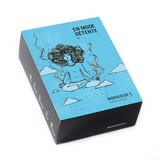 Anti-Strain herbal tea - Monsieur T.
This is a known fact: a stressed person is more irritable and prone in engaging into public emotional behavior. Before that happens, try this spicy blend of cinnamon, licorice root, ginger, fennel, orange peel and cardamom. The mildly sweet aroma and relaxing ingredients will make you breathe freely. Contains: Cinnamon pieces, licorice root, ginger pieces, fennel, orange peel, cardamom.